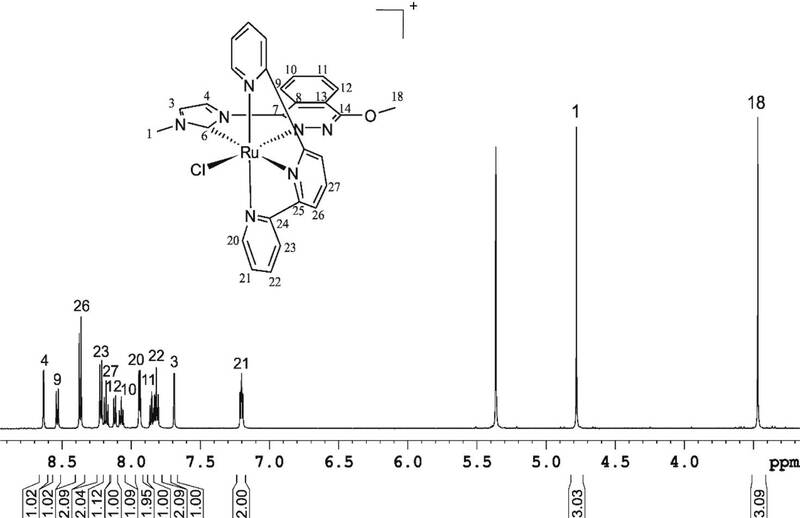 ABSTRACT A new CNNC carbene-phthalazine tetradentate ligand has been synthesised, which under reaction with [Ru(T)Cl3] (T = trpy, tpm, bpea; trpy = 2,2′;6′,2″-terpyridine; tpm = tris(pyrazol-1-yl)methane; bpea = N,N-bis(pyridin-2-ylmethyl)ethanamine) in MeOH or iPrOH undergoes a C-N bond scission due to the nucleophilic attack of a solvent molecule, with the subsequent formation of the mononuclear complexes cis-[Ru(PhthaPz-OR)(trpy)X]n+, [Ru(PhthaPz-OMe)(tpm)X]n+ and trans,fac-[Ru(PhthaPz-OMe)(bpea)X]n+ (X = Cl, n = 1; X = H2O, n = 2; PhthaPz-OR = 1-(4-alkoxyphthalazin-1-yl)-3-methyl-1H-imidazol-3-ium), named 1a+/2a2+ (R = Me), 1b+/2b2+ (R = iPr), 3+/42+ and 5+/62+, respectively. Interestingly, regulation of the stability regions of the different Ru oxidation states is obtained by the different ligand combinations, going from 62+, where Ru(III) is clearly stable and mono-electronic transfers are favoured, to 2a2+/2b2+, where Ru(III) is almost unstable with regards to its disproportion. The catalytic performance of the Ru-OH2 complexes in chemical water oxidation at pH 1.0 points to poor stability (ligand oxidation), with subsequent evolution of CO2 together with O2, especially for 42+ and 62+. In electrochemically driven water oxidation, the highest TOF values are obtained for 2a2+ at pH 1.0. 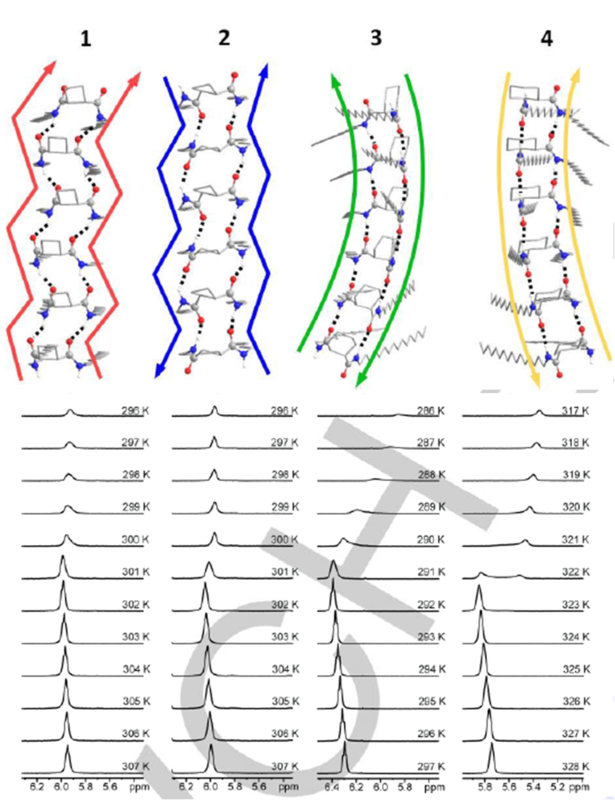 In alkene epoxidation, complexes favouring bi-electronic transfer processes show better performances and selectivities than those favouring mono-electronic transfers, while alkenes containing electron-donor groups promote better performances than those bearing electron-withdrawers. Finally, when cis-β-methylstyrene is employed as substrate, no cis/trans isomerization takes place, thus indicating the existence of a stereospecific process. Selective Refocusing (GSERF or the recent PSYCHEDELIC) experiments were originally designed to determine all proton-proton coupling constants (JHH) for a selected proton resonance. They work for isolated signals on which selective excitation can be successfully applied but, as happens in other selective experiments, fail for overlapped signals. To circumvent this limitation, a doubly-selective TOCSY-GSERF scheme is presented for the measurement of JHH in protons resonating in crowded regions. This new experiment takes advantage of the editing features of an initial TOCSY transfer to uncover hidden resonances that become accessible to perform the subsequent frequency-selective refocusing. Enantiomerically pure C16-alkyl amides derived from cis and trans cycloalkane-1,2-dicarboxylic acids, respectively, have been synthesized and their behaviour as organogelators has been investigated. These compounds include cis/trans diastereomeric cyclobutane and cyclohexane derivatives with the aim to explore the influence of the ring size as well as the relative configuration in their hierarchical self-assembly to form gels. 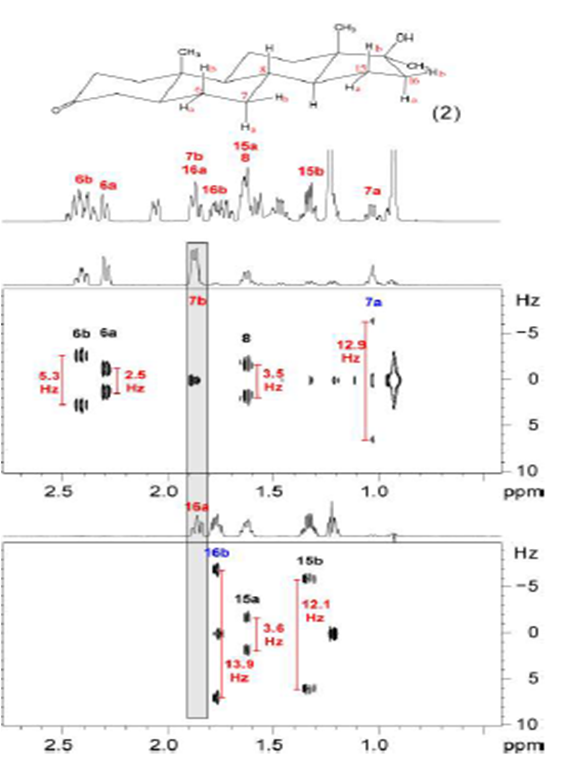 High resolution 1H NMR spectroscopy studies allowed the determination of the dynamics of the gelation process in [D8]-toluene and the sol-gel transition temperature. 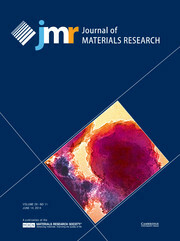 The morphology and size of the aggregates have been investigated and results have shown that, in the case of cyclobutane derivatives, the cis/trans stereochemistry is not relevant for the gelation behaviour and the properties of the soft-materials obtained, but it is remarkable for cyclohexane diamides, which are better organogelators. The four compounds produce chiral aggregates despite that two of them are meso achiral molecules. We show in this work that this fact is an example of stochastic symmetry breaking induced by sonication. The self-assembly of these molecules has been modelled providing information and support about the structure and the chirality of the aggregates. 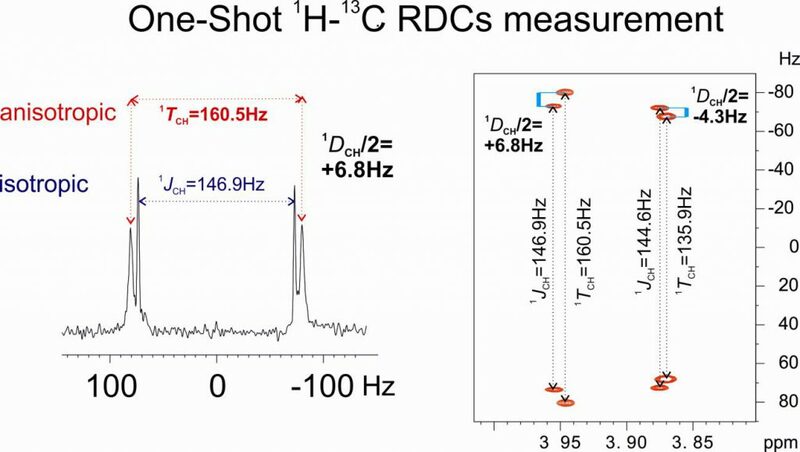 Application to the structural discrimination of small molecules containing multiple stereocenters. One-Shot determination of residual dipolar couplings. Castañar, L.; Garcia, M.; Hellemann, E.; Nolis, P.; Gil, R.; Parella, T.